Our first tutor for the year spoke at our May 2018 meeting and we were wowed by her commitment to perfecting her stitching. 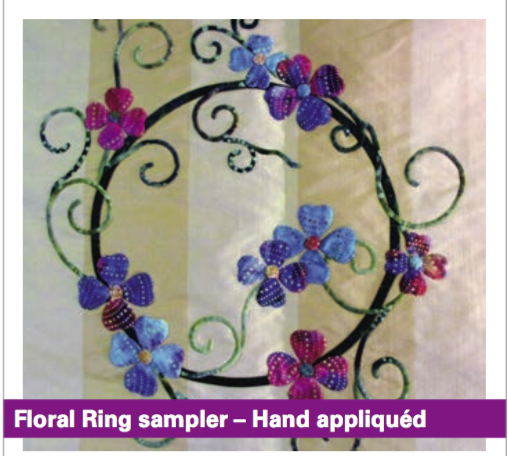 A needle turn appliqué workshop from one of the best artists in this field. Julie won Best of Show at Victorian Quilters Showcase in 2018. There is a choice of two projects focussing on slightly different skills. Suitable for beginners to advanced, although the paisley example would require some prior experience. Two one day workshops in machine quilting. Learn how to set up your domestic machine for ruler work including a special ruler foot. 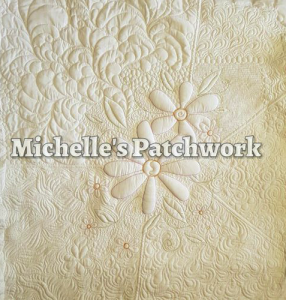 Then learn how to use the rulers and how to design quilting following methods Michelle has developed over the years. 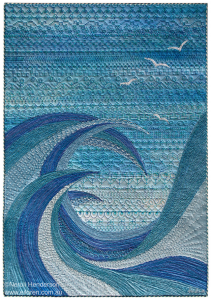 Learn free motion quilting and some thread work to enhance a quilting design. 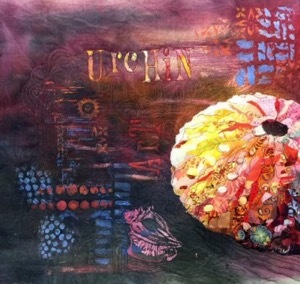 Sea Urchin quilt using painting, dyeing, stamping and stitching. 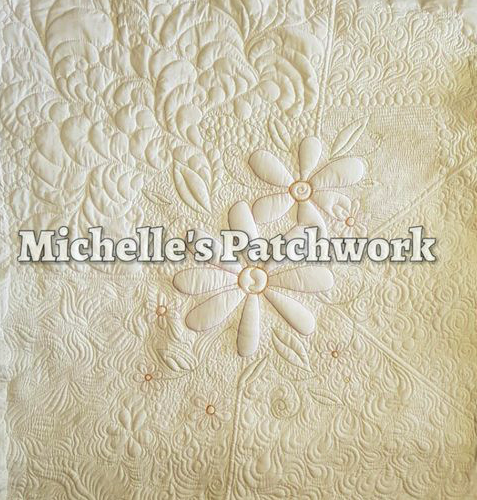 Foundation pieced spikes blocks separated by appliqué vine and leaf sashings. 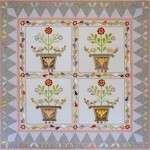 Learn paper foundation piecing and machine appliqué skills. non-members $130 plus materials list. An easy, fun class that will increase your design, colour and composition skills and show you everyone can be a art quilter. Waking with ultra-smooth metallic fabric paints learn to blend paint smoothly on fabric, prevent colour run and see how it can make stitching and raw edge appliqué easier. Works can be completed with machine stitch using decorative stitches on your machine inventively. Members $100 plus a kit fee of $25 to be paid to Neroli. Non-members $130 plus kit fee. Our tutors in 2017 were Leanne O’Sullivan, Shibori dyeing; Leesa Chandler, bag making; Jeanette Holkner, children’s workshop; Bronwyn van’t Hof, quick quilts from precuts and Grace Errea from USA delivered a lecture on value and conducted two workshops using her unique appliqué technique. In March 2015 Lisa Walton came down from Sydney to run her Permission to Play class. This surface design class focussed first on making patterns on fabric using a variety of techniques. Then the fabrics were assembled into a collage. Lisa encouraged everyone to play with colour and texture and to not worry too much about planning. While it was a lot to cover in two days, the participants had lots of fun and everyone was pleased with the results. You can see the results in this gallery. I have just moved to south melbourne and am looking for a quilt/textile group to join. Are you taking new members? Where and when do you meet? Hi, just wondering when your quilt show is on? Our Quilt Show is every second year, the next one will be the last weekend in May 2016 at the Mount Waverley Community Centre, Miller Crescent Mount Waverley. 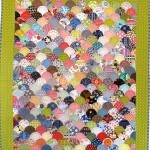 Hi, I am interested in commencing day time beginner patchwork classes. Your group has been recommended. Do you have any opportunities for classes commencing soon ? 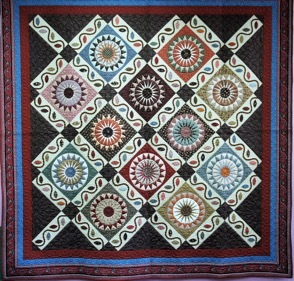 We will be running beginner patchwork and quilting classes in the second part of this year. 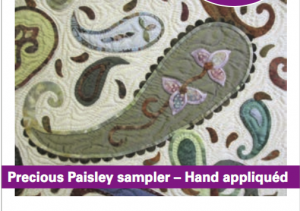 Visitors to our Quilt Show will have the opportunity to complete an expression of interest in these classes.